On the 15th and 22nd March, the EAThink Team was invited to take part to two seminars entitled R.O.P.E. (Reshaping Our Educational Practice) targeting Heads of Department of all subjects and organised by the Ministry for Education and Employment. The aim of the seminar was to promote the integration of Education for Sustainable Development (ESD) principles within the different subjects taught in schools. 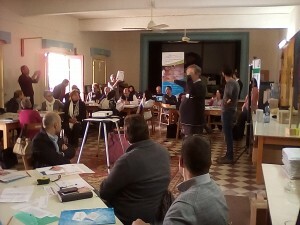 The last part of the seminar saw the participants, divided into groups, attending different stations with representatives from various organisations presenting a number of projects related to Education for Sustainable Development and Global Education, among which the EAThink project. The team presented the Heads of Department with information, opportunities and resources related to the EAThink project, including the apps “Robin’s Cake” and “Eathink Game” in Maltese. A total of 45 Heads of Departments from Secondary schools in Malta and Gozo approached the EAThink station and expressed their interest in knowing more about the project and pass relevant information to the teachers of their respective subjects. In Malta, Heads of Departments are Secondary school teachers who are responsible for mentoring and supporting teachers of a particular subject in a number of schools and in different colleges.